I will never forget the one thing Anna Wintour said in the 2009 documentary The September Issue that changed my entire view of Vogue Magazine and the fashion industry. She said that putting a Black woman on the cover of the September issue the first year she was editor-in-chief was one of the biggest mistakes she's made in her career. 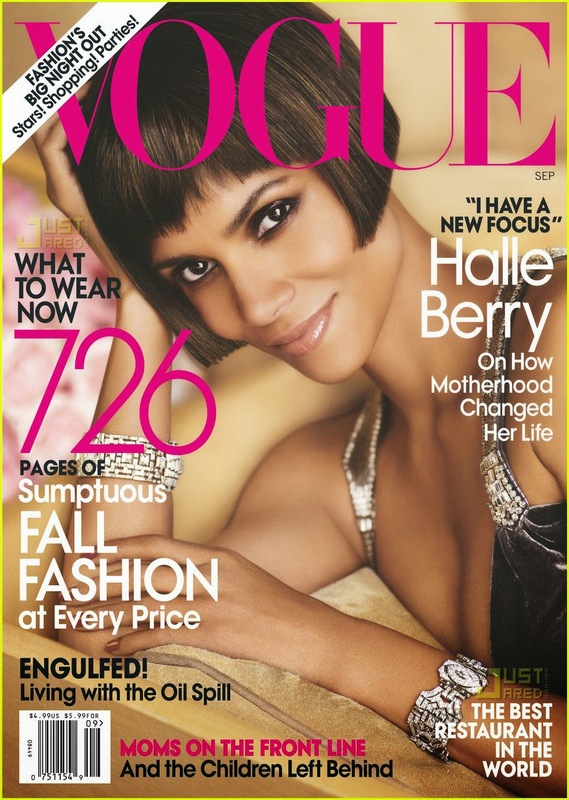 Openly and outright she stated that she didn't want an African American woman on an influential cover of her magazine. Yet this month Lupita Nyong'o graces the cover of American Vogue. I've talked about how happy I am that Lupita, a beautiful black woman, has become the face of a well known and influential beauty brand (Lancome) and continues to succeed in her career in such an inspiring way, but I don't want her on the cover of Vogue Magazine. Even though she's not on the September issue it's offensive to think that the women in charge of the publication is not proud to have her on the cover. Lupita is a star and is making a ripple in Hollywood stereotypes and expectations, but that alone is the reason she is on the cover and that is not okay. 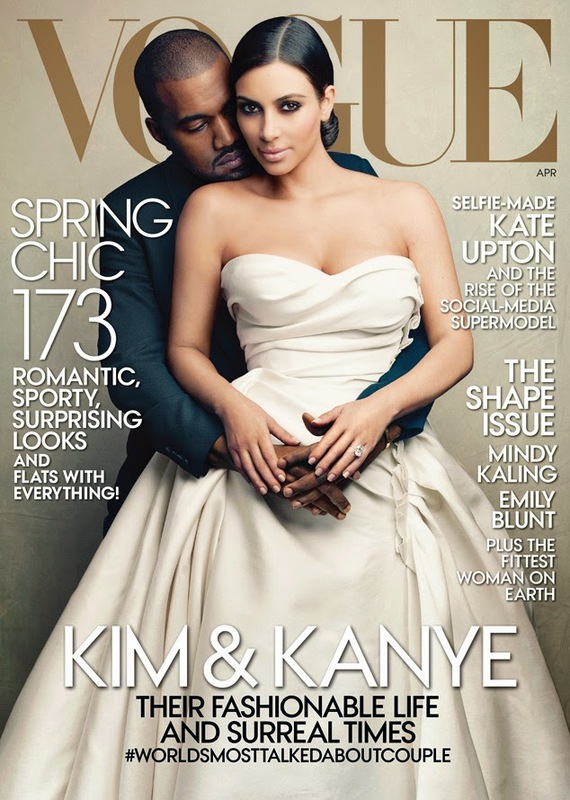 Not too long ago Kim Kardashian created a controversy by being Vogue's April cover star. The media and Vogue readers had a lot to say about the integrity of the magazine for putting such an "unworthy" celebrity on its cover. The outcry was outrageous, but the bigger issue was that just a few months prior Anna Wintour herself said she would never put Kim on her magazine and did not support her career or fame. Yet Kim now boasts an American Vogue cover on her resume. Why does Vogue Magazine think it can bash and disrespect celebrities and Hollywood personalities but continue to use them for publicity and sales? What makes Vogue think it can take advantage of the women who have worked so hard to get where they are today? We, as consumers and fashion lovers, continue to refer to Vogue as the fashion Bible and treat every editorial spread or "insightful" article as though it is the Holy Grail of the fashion industry when really we're supporting an industry that builds itself by cheating and disrespecting the personalities that appear in and promote its publication. Fashion bloggers pride themselves in showing the "real" side of the fashion world and being the relatable and reliable girls next door. Being real is what we cling to in this fickle industry and being honest gives our voices the influence they deserve. Being true to ones self is being real in all aspects that we present to the world, not just in our tweets and Instagram posts. Everything that we publish is a reflection of our views -- what we agree and disagree with. So why don't we hold Vogue Magazine to that same standard?? It was more shocking to me that no one ever said anything about it in the reviews or anything. But Vogue is held to way too high of a standard in more ways than one. I had a subscription a few years ago and I didn't even like the content of the magazine. It's probably my least favorite fashion magazine. Hmm. now see, this post is REAL. I love that you didn't hold back. I appreciate boldness; it's rare and will take you far! Wow! I had no idea Anna Wintour said that- how disgusting of her! We live in the 21st Century, I don't see why Vogue Magazine can't just get with the times? Lupita, alongside other women of colour, is absolutely stunning? Yup, Naomi Campbell was the cover she was talking about which is so ridiculous because Naomi was HUGE at the time. But the problem isn't her distaste for black women are Vogue covers. It's the fact that she still puts them on her magazine to gain sales and publicity because they are so popular. She's featured Oprah, Michelle Obama, and Rihanna among others on the cover but they were chosen because of their vast popularity. Oprah is one of the most successful women in America, Michelle Obama is the First Lady, and Rihanna just won the highest CFDA for a celebrity. The Great Miss Wintour is just using them for their faces and THAT, my dear, is my problem. Thanks for chiming in! Well, from a business woman kind of view, it's good that she can differentiate between her personal likes or dislikes and what she puts on the cover of Vogue. It's a business, a magazine that needs to be sold – whether she likes who or what is in it or not. Still, I think the power that people allow her to have is ridiculous. She, as a person, can speak out about her personal likes or dislikes and people follow like lemmings. It's disgusting, really. And I'm glad that there's someone else out there who also thinks that this woman's behavior is impossible. Most people wouldn't dare to speak out against her! ... which I think is ridiculous as well – the fact that people don't dare to say anything against The Great Miss Wintour. Thanks for reading, Sabrina! Personal and professional should always be separated where they can and that can be hard when you're a "fashion industry personality" but these are things she said as the Editor in Chief of Vogue not as Anna Wintour. She spoke out in a documentary about the magazine she works for and she explicitly states "...will never be on the cover of my magazine." That goes beyond personal opinion. She *claims* to be speaking on behalf of the American Vogue brand as a whole. Lol, I did not know about this, Anna should show some consistency in what she´s saying and doing, or she should keep her personal thoughts for herself. It is logical that Vogue would want to boost its sales using famous celebrities on its covers and doing interviews with them, celebrities would bring them money easily. Boosting sales is a part of business and I'm not against her putting celebrities on the cover because pf their popularity. She just shouldn't go out and speak on behalf of the brand and make statements that contradict what her brand actual puts in and on its magazine. You're right. She should just keep her opinions to herself. A really interesting post and so true! Such magazines as Vogue should stop being so hypocritical! And it makes it even worse that people treat it with such reverence! I love this blog, it looks great! This is a very controversial topic but I feel like I have something to say. I do not believe Anna Vintour lacks respect for black women, but probably what she meant by the fact it was a mistake that it did not get the required response from the audience. The people in the publishing business make their decision based on value and money - this is a fact of life we have to face. Therefore, despite the personal opinion of Anna Vintour, a celebrity can be on the cover even if she doesn't like it because there are also people above her and other people on her team. But the most important thing I'd like to say is that I'm sure Kim knows how Anna feels about her and I'd say the same for Lupita. Since they both accepted the offer and didn't decline it, isn't it okay? Both parties are happy. If that decision doesn't resonate with the audience on a high enough level I'm sure Vogue will go another way in the future. It's all about the stats that the readers make. With that being said, I have no ill will towards publishing companies doing what businesses do, which is make decisions to garner more money. However, the problem is that the black woman in question was in fact Naomi Campbell who was a huge figure in the fashion community and was a high profile "celebrity" at the time so I personally find it hard to believe that featuring one of the biggest names in fashion of the time brought in such a small number of sales compared to the usually that she needed to make that statement in the documentary. Of course Anna Wintour is not Vogue Magazine (even if some people treat her like she is) and her opinions don't have to match those of the Vogue Magazine company, but when she speaks out in a documentary as the editor-in-chief or releases a statement about a certain celebrity in regards to their relationship to Vogue Magazine she is speaking on behalf of the company she works for. One of the basic rules of professionalism is that when you go out and say things in particular settings (like a film about your company or a conference held by your bosses and/or colleagues) you represent your company with everything you do and say so that makes her opinions no longer just her own. It's not just about black women or even minorities. It's about what she says in situations when she's speaking on behalf of her company. And yes, Kim should NOT have accepted the cover knowing what Anna Wintour had said about her but it's Kim Kardashian so I can't say I'd expect anything otherwise. Thanks again Lesia for commenting! I really appreciate it. Thank you for replying, this turned out quite a nice discussion! My comment turned out much longer than I thought it would and I didn't even notice until I published it. Thanks again for joining in on the conversation :) She can be a bit outspoken at times so I think it probably is just her personality given the high position she's in. None the less she's good at what she does. I just don't happen to be fan, though mostly for reasons completely separate from her black women and Kim K comments. BTW I checked out your blog last night and I really liked it.Your photography skills are amazing and the pink lipstick and eyeliner you're wearing in "Color Riot". Your pictures make Amsterdam look stunning! Though I don't agree with creating a separate "black" Vogue (Italian Vogue already has a version of this on its website), I do believe that some major changes need to be made. As I Nigerian myself, I'd really be interested in seeing a Nigerian Vogue. We're a long way from such a publication, but it would add a much needed flavor of diversity. Thanks for reading, Biki!